Oriental Outpost ran on limited staff from July 25th - August 14th 2017 so that I could take a big journey to find more Asian artwork for you. 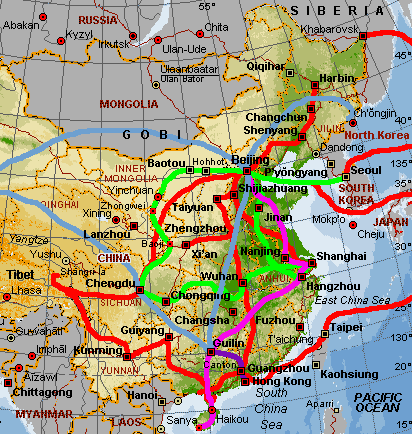 I covered about 20,000 miles round trip from San Diego with stops in Chengdu, Guilin, Beijing, and Tokyo. Before 2008, my trips often covered 35,000 miles each, so this one was short in comparison. I don't have a full-time staff in the USA anymore, so when my wife and I head out, there's nobody left behind for daily packing and shipping duty. Upon my arrival in Beijing, a lot of artwork was mounted at the workshop, then packed into special suitcases for the flight back to the USA (via Japan). Starting in San Diego, and flying on Air Canada to Japan via Vancouver. Continuing to Chengdu, Guilin, Beijing, and Tokyo on Sichuan Airlines and Hainan Airlines. Back to North America on Air Canada with a night in Toronto before the return to San Diego. 7/25 Flew from San Diego to Tokyo, then on to China. 7/27 1:15 AM: Arrived in Chengdu, China. Got to sleep at hotel by 2:30AM. Woke up at 5AM (thank you jet-lag). Walked a couple miles to the art and curio market. By 9AM, We located our longtime friend Huang Xin-An. Bought about $4000 worth of artwork so far. 7/28: Bought a lot of nice chop stones here as we plan to market signature chop carving a little more aggressively this year. Chengdu is really hot and humid. Two showers a day is not enough. Tomorrow the plan is to look for a new master calligrapher. 7/29: Found and met with a few calligraphers. Also got a lead on an easy-to-work-with master calligrapher in Shaanxi province. 7/30: Woke up at 3:30 AM for an early flight to Guilin. Spent time with Shaoman, who happens to be Ou-yang Guo-de's sister and gallery owner. She's got lots of good stuff here. I'll finish picking out a few hundred great paintings for my customers tomorrow. She's got artwork from some new budding artists that I'll be introduced to as well. All good stuff. 7/31: Overshot my budget in Guilin. Bought around $14,000 worth of artwork. This was partially because I found so much good stuff, but also, prices have gone up here in China a lot. 8/1: Returned to Beijing. A/C was broken on the airplane, so all of us passengers just sweated to death the whole way. I need to take a break - I crammed 2 weeks of work into 1, and haven't slept more than 3 hours per night. 8/6 - 8/13: Hanging out in Tokyo now. Nice to finally be in a place where they don't ban Google, Facebook, and Youtube. Having to tunnel through a proxy server just to read my Gmail was a real pain in China. Some announcements here in Tokyo include nuclear war preparation now that Trump threatened North Korea. Bomb shelters are opening, and people in Japan are scared of what Trump will say next to provoke Kim Jung-Un. Some people are pulling cash out of the bank and stocking up on food and water in case of war. It might seem far off when in the USA, but it's getting real here. While virtually everyone in Japan agrees that Kim Jung-Un is crazy, the consensus is that crazy must be handled with calm restraint. Kim crawls back in his hole like a groundhog after he is assured that he is the craziest world leader on the planet or sees his own shadow. Fighting crazy with crazy seldom works; it's like poking a rabid dog with a stick. If you get the chance, please let Mr. Trump know. 8/14: Flew from Tokyo to Toronto. Air Canada forces you to take all your bags out with you, even though you are in transit. Trucking around 5 suitcases of artwork to and from a hotel for my 12-hour layover sucked. 8/15: While most Canadians are polite and warm-hearted, this morning, found that Toronto Airport is run by the most ill-tempered Canadians and foreign workers that I have ever met in my life. This is the second-worst airport in the world (the worst is LAX in my opinion). Best in my experience are San Francisco, Narita, Chicago, and Orlando. Air Canada Rouge (their discount carrier) is really bad. Took that from Toronto to San Diego. Everything comes at a price. $8 for a stale sandwich at 30,000 feet. Even the sparkling water was $3. No entertainment system on the plane (unless you bring your own). No charging ports, dirty plane, broken lavatory, and contemplated amputating my legs above the knees to make them fit the tight seat configuration. I don't care what it costs, I will fly Japan Airlines next time - JAL's economy/coach is like business class on a North American carrier. Trips before 2005 are shown in red. Of course, this is not my first trip across China. Since 1998, I've found many adventures across Asia. My first time in Asia was a humanitarian venture in far-east Russia. Later I spent time in Japan, Korea, Chinese-Taiwan, Hong Kong, and more. The most traveled country in my life is China (also where I call home for part of the last 15 years).